The only thing I adore more than creepy crawlies is writing and talking about them. My childhood obsession with arachnids blossomed into an adult dedication to science communication when I joined the University of California Santa Cruz to study ecology and evolutionary biology. It was there that I took a course in science journalism. After writing a few short words about the molecular details of black widow venom working its magic on someone’s unfortunate neurons, I was hooked. My love of communicating science and deep interest in animal behavior led to a quarter abroad in Costa Rica, where I studied the courtship behavior of tropical tarantulas. That adventure culminated in me doing what I do best: sharing my findings with the people of Monteverde, Costa Rica, through a public presentation. 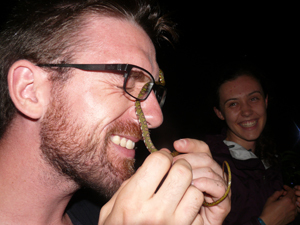 As I jumped around before the audience, acting out the courtship ritual of Sphaerobothria hoffmanni, the Costa Rican horned tarantula, my feelings were further affirmed; I want nothing more than to instill excitement about life sciences in people. Today, I report on environmental news, animal behavior and ecology in Santa Cruz. Beyond writing and reading, I enjoy attending my local Toastmasters club, practicing Brazilian Jiu-Jitsu, exploring the Santa Cruz Mountains and riding my beloved motorcycle.